Graco pressure relief indicators from MotionSource keep your machine running while lubrication gets to critical points. Graco pressure relief indicators pinpoint lube line blockages but allow the lube system to continue to supply lubrication to points that are not blocked. MotionSource gives you the freedom of no time or effort required for reset after blockage is cleared and allows your machine to continue to run while non-critical bearings are lubricated. For use with MSP, MX, MXP, MJ and MHH divider valves, pressure relief indicators provide easy information on blocked lines, high system pressure or blocked bearings. 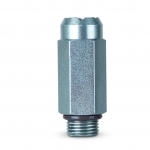 Pressure relief indicators feature the Trabon indicators you have relied on for decades. They are pressure-sensitive devices that pinpoint excessive pressure in Trabon series progressive lubricating systems. These devices, which are installed in the alternate outlet ports of divider valves, signal a fault either by causing an indicator pin to protrude or by releasing lubricant to the atmosphere. Graco performance Indicators respond quickly to protect your lube system and locate lube line blockage. MotionSource recommends that some type of indicator be used to monitor every working outlet of your centralized lube system.